This is a painting I did from a photo that I got from my best friend, Lynn. 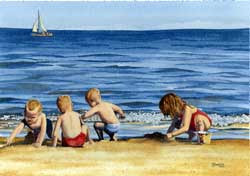 This was a picture of Lynn and her brothers on the beach in Michigan several (I won't say how many!!!) years ago. When I saw the picture I just had to paint it. Happy summer! To see more of my artwork visit my webpage by clicking here.